A trip was never so relaxed as with your tickets for AVE Madrid Barcelona. If you are going to travel to Barcelona, the best way of choosing transportation is to think of the binomial cheap price-assured comfort, and the cheapest, simply in all the aspects, and most comfortable in travels between Madrid and Barcelona is AVE, but, although the prices for travels by AVE, both to Barcelona as in general, have decreased dramatically, only with our search engine you have a clear path to see the cheapest combination of fares, categories, timetables, etc. so that your journey by AVE trains Madrid Barcelona is really the cheapest that exists. We are your low cost provider of AVE tickets Madrid - Barcelona. Equally, for the return, AVE Barcelona Madrid. Surrender to all the obvious advantages that have the travel in the AVE Madrid - Barcelona, since paying between a minimum of minimum of 32,30 € and a maximum of 214,20 € you will be at full speed, in the means of transportation that has the most comfortable seats and gives you more freedom than any other means of mass transportation of people. High speed, Low prices, but only on Trenes.com. Check the timetables for AVE from Madrid to Barcelona on AVE schedules Madrid to Barcelona. A trip on the AVE Madrid - Barcelona is ideal whether it is a personal trip or a business trip, with scheduled departures that are met strictly, between 5:50 h and 21:25 h and durations from 2 hours 30 minutes up to 3 hours 10 minutes to perform at the maximum speed the 505 Km that lie ahead in the path between Madrid and Barcelona. We present a new way to see AVE tickets Madrid Barcelona. The search for the AVE train ticket from Madrid to Barcelona for the best price was made on the 27/03/2019 a las 12:08 h, it is a AVE-TGV train with departure on the 19/04/2019 a las 13:25 h and arrival on the 19/04/2019 a las 16:24 h. The price of the cheapest ticket has been 32,30 € and the cheapest rate possible for this ticket has been the Promo fare. Trenes.com issues official AVE Madrid Barcelona tickets and it does totally legally as a verified and authorised travel agency by Renfe, ie if you buy a AVE Madrid Barcelona ticket through our website, you only need to print the ticket or to show the bidi code sent to the mobile phone, present it at the Madrid Atocha station and get on the train you have got assigned. 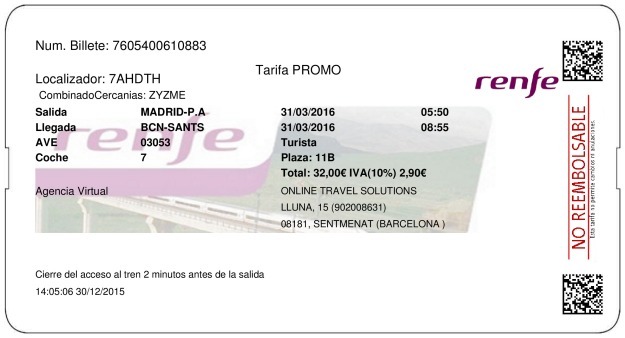 This is a real example of a Madrid Barcelona ticket issued by Trenes.com. On it you can see the ticket number 7605400610883, the locator 7AHDTH, the origin and destination stations, in this case the train travels from Madrid Atocha to Barcelona Sants. The railway operator Renfe, the train type AVE, the train number 03053 and the rail car 007. The contracted rate Promo in Turista class, the assigned seat 11B, the price for the ticket, this Madrid Barcelona train ticket is not necessarily the cheapest ticket since the price of the train ticket often depends on the time in advance with which you bought the ticket. In this case the price is 32,00€ and the departure date is 31/03/2016. The train departure time of this ticket is at 05:50 h and the arrival of this train at the Barcelona Sants station is at 08:55 h. The duration of the journey from Madrid Atocha to Barcelona Sants has been 3 horas 5 minutos. 505 Km in which the AVE will take you pampered to Barcelona, saving you the hassle of driving, having to park, possible traffic jams, etc. The cheapest way to buy your tickets AVE Madrid - Barcelona is on Trenes.com. You will no longer have to adjust your seatbelt on your travels to Barcelona, in no sense, nor economical or in the car, you will not have to drive the 505 Km either, now we are the ones who adjust the belt to the prices for the AVE tickets Madrid - Barcelona, that is why, on our webpage you will not find them above 214,20 €. Turn your travel from Madrid to Barcelona into reality with our tickets AVE Madrid - Barcelona. You can depart from Madrid between 5:50 h and 21:25 h, and to select the most convenient of all, we give you two tips, if you want your trip in the AVE Madrid Barcelona to be the cheapest that exists, the proper departure time is the one at 20:30 h and if you want the journey in the AVE Madrid - Barcelona to be as short as possible, then chose the one at 17:00 h. We guarantee an impeccable track record in finding the cheapest AVE tickets Madrid - Barcelona. Barcelona Sants hosts several AVE trains during the day. From Barcelona you can travel to different locations in Spain and also outside of Spain: to France. The connection that is used most frequently is the one which travels between Barcelona - Madrid. The journey from one city to another is so fast, that there is no transportation that will make the AVE fade. Estació de Sants has two floors. The ground floor contains access to the tracks, ticket sales, customer service, cafeterias, restaurants, shops and car rental, etc. On the other hand, in the underground are the tracks and the platforms. There are 14 tracks. There are lifts and escalators to access the tracks. The railway services that it receives are several. 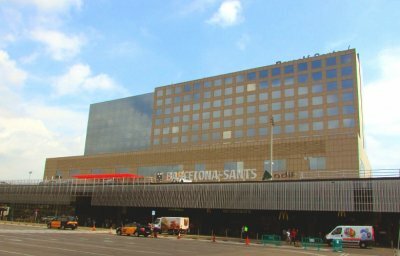 Until the works of the Barcelona-La Sagrera station finish, Barcelona Sants will be the stopping point for most high-speed trains. The station is located in Plaça dels Països Catalans in the district of Sants-Montjuïc and it is very well connected by metro and urban buses with the rest of districts of the city. The station provides services of Medium and Long Distance, High Speed ? ?and Rodalies de Catalunya. On the station there is a hotel of the Barceló chain. The opening hours are from 04:30 to 00:30 h. The services available to the passenger are various: lockers, ATMs, parking, toilets, cafeteria and restaurant, Club Room, Wifi, etc. Madrid is not the only destination from Sants. There are many other routes by AVE. Barcelona - Sevilla, Barcelona - Valencia, Barcelona - Zaragoza, Barcelona - Paris, Barcelona - Ciudad Real, etc. Sants sees all kinds of trains. In addition, there is also urban bus service and taxis at one of the exits of the station. The bus stop is also next door. The route Madrid Barcelona is a success and it is the most requested route. Apart from the speed of arrival from the station of origin to the destination station, it offers many more advantages. For example, you have the suitcases included. Depending on the rate, you can change your tickets for free and children under 4 travel for free. These are some of the advantages with which we can compare the use of the AVE with the airplane and see what suits us more. Barcelona is one of the most visited cities in the world. Is it due to the architecture of Gaudí? Or the beaches? Surely it is for many factors at a time. Good weather, good gastronomy, elegant architecture and many more attractions.